First of all, this Christmas I became obsessed with getting a comfy cardigan for myself. This came about because even though I have a ton of winter sweaters, I didn’t have one that comfy, casual and looked great! I have sweaters that are pullover hoodies, and work cardigans that are more formal. However, I did not have a casual cardigan for everyday wear. These give you an idea of the style I was going for, and the feel; something cozy and something warm. 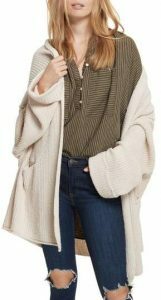 So, I researched on Amazon and added a few cardigans to my wish list. I did end up getting a great sweater from Amazon for Christmas, but it ended up not being exactly what I had expected. The material was comfortable and warm, but the fit was slightly off since I wasn’t able to try it on before I received it. It is my absolute favorite sweater I own right now. I practically wear it daily. It does stretch as I wear it, but a quick wash and dry does the trick to return it to the former size. The gray color is a nice combo match with a lot of my wardrobe, so I have no problems matching it with items. It also has beautiful detailing of stitches on both arms to differentiate itself from other cardigans. It is a style bloggers dream! What is one of your favorite winter items you wear a lot? I know a lot of people’s go-to items are comfy sweatpants or comfy yoga pants. This has definitely become a staple cardigan for me. I’m already scouring Pinterest for my next staple item. If you are interested in my staple art supplies this winter head on over to my post – Christmas Art Supply Haul and check out my recommendations there.